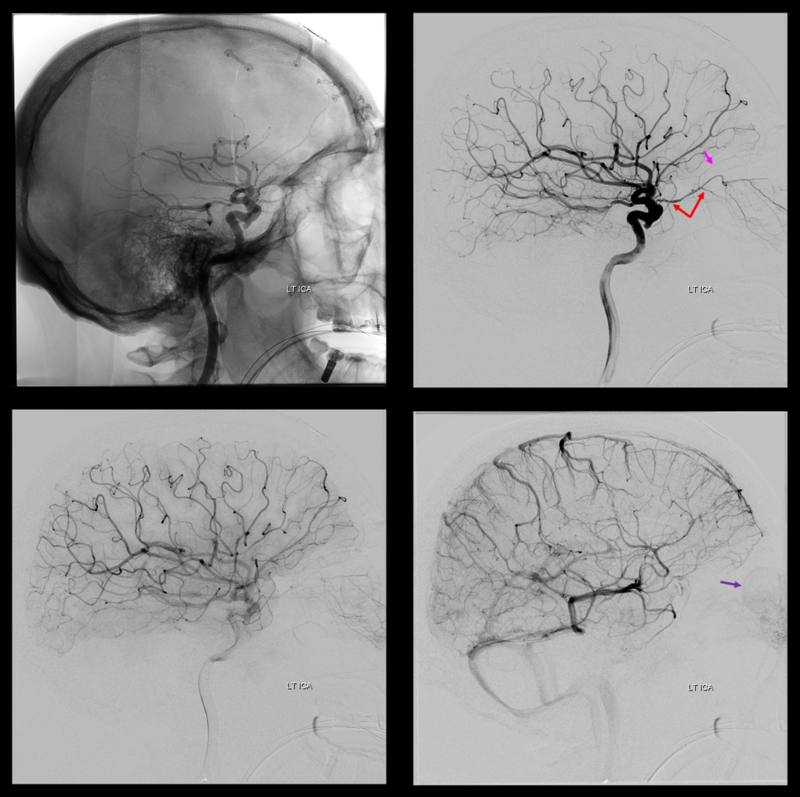 The Middle Meningeal Artery is the largest branch of the Meningeal Arterial Network, by far. 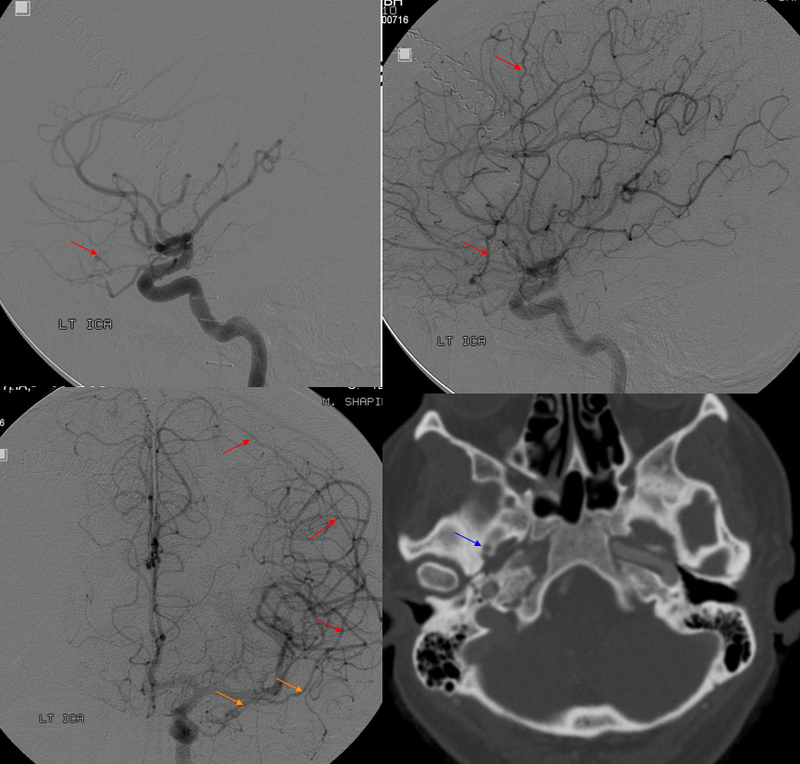 Usual origin from the proximal Internal Maxillary Artery (IMAX), with multiple clinically-important variants. 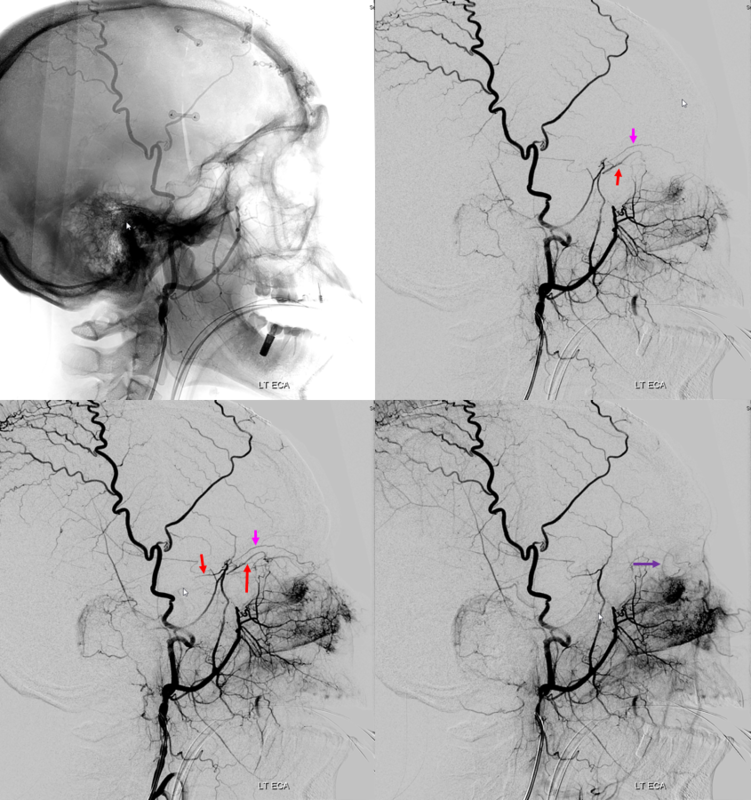 Multiple connections to other key vessels, including ophthalmic, internal carotid, MHT, ILT, ascending pharyngeal, occipital — these can be either useful treatment routes or “dangerous anastomoses”. Lets keep it simple — the more pictures, the better. Fancy name for MMA origin from the Ascending Pharyngeal Artery, via its inferior tympanic branch. 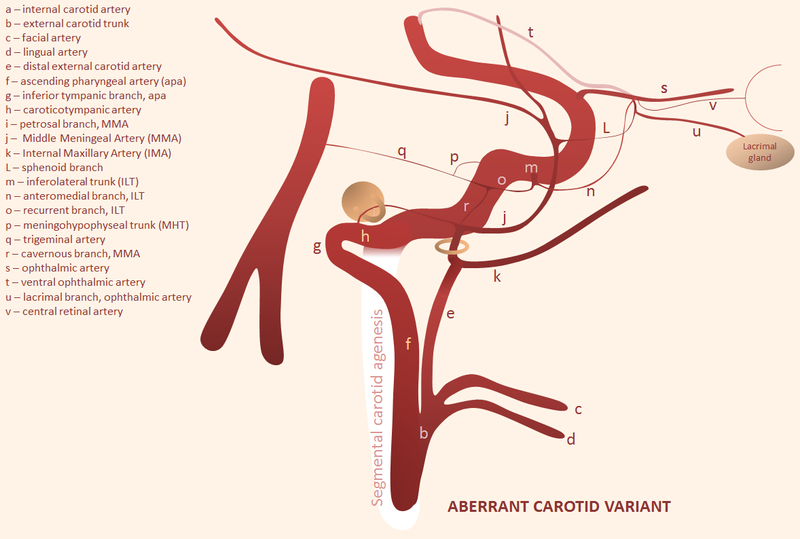 This is an important branch, more because it is part of what makes up the “aberrant carotid” artery (see below). As far as MMA is concerned, this is what happens. 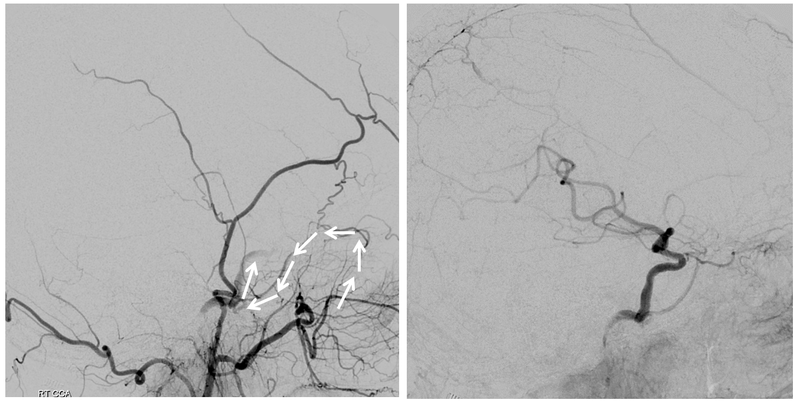 The anastomosis in this case does not go through the crura of stapes. 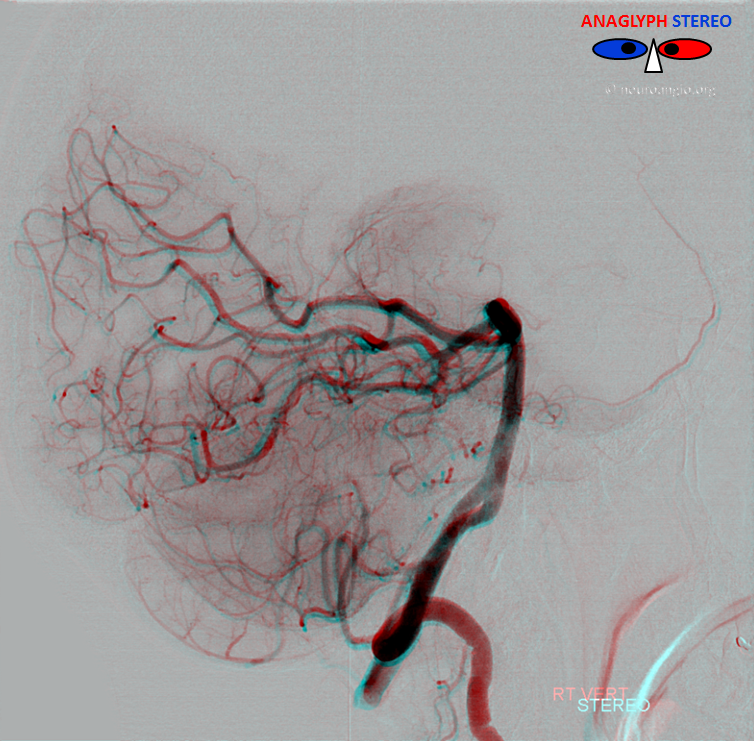 On some level its just probability — any arrangement is possible, including some extremely rare ones. 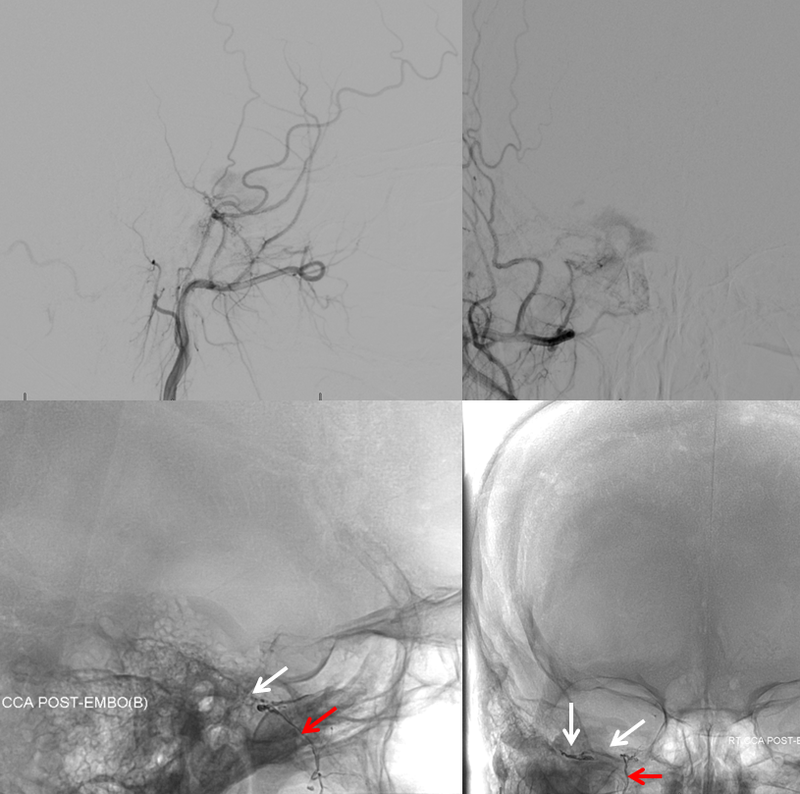 This one, courtesy Dr. Erez Nossek, shows how MMA can arise from Trigeminal Artery (q) via its connection with the cavernous branch (r) of the MMA. 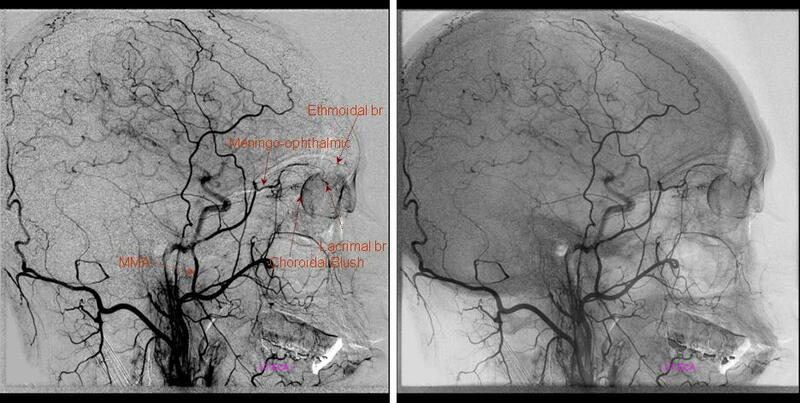 Because the Trigeminal Artery (see dedicated page here) can arise from either basilar, SCA, or AICA, the MMA can do the same. In fact, this here is the only known case of SCA-origin MMA we are aware of. 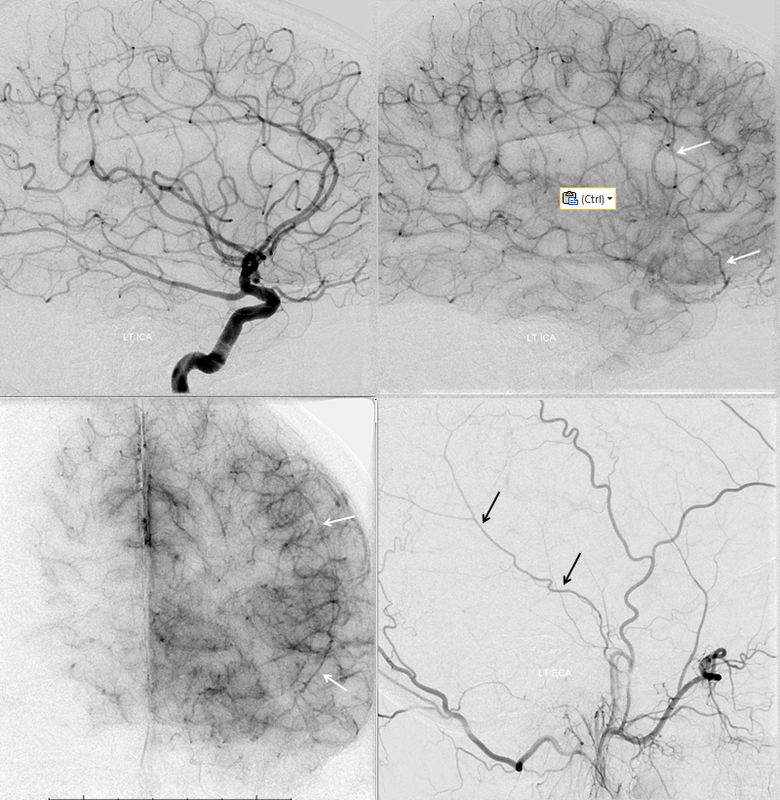 We are going to keep it here and spare everyone the pleasure of reading it in some journal of obscure case reports. 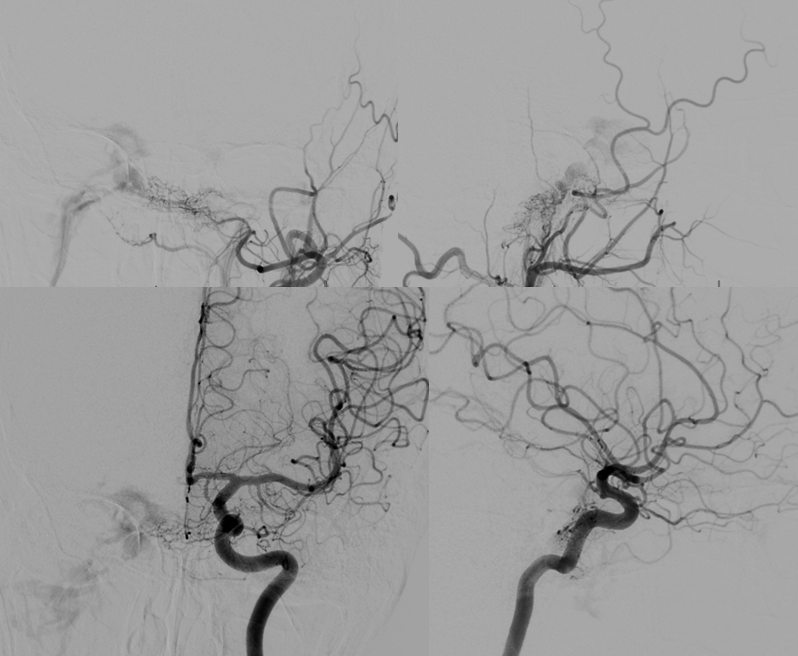 Wanna see some imaging examples? There are plenty on the “Ascending Pharyngeal Artery” Page. Now back to the MMA. 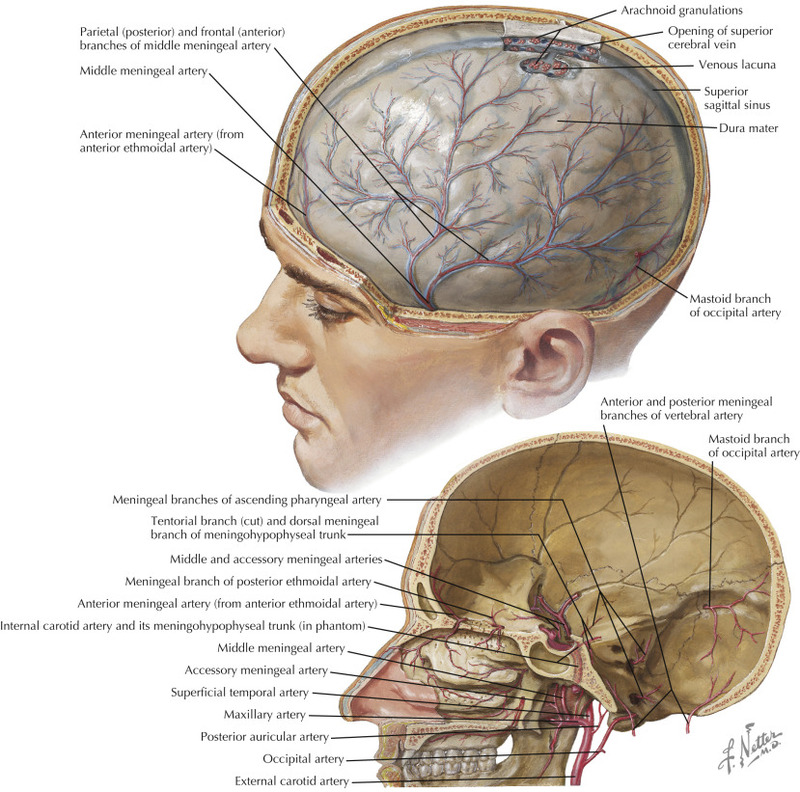 Petrous Branch — facial and petrosal nerve supply. Be careful. 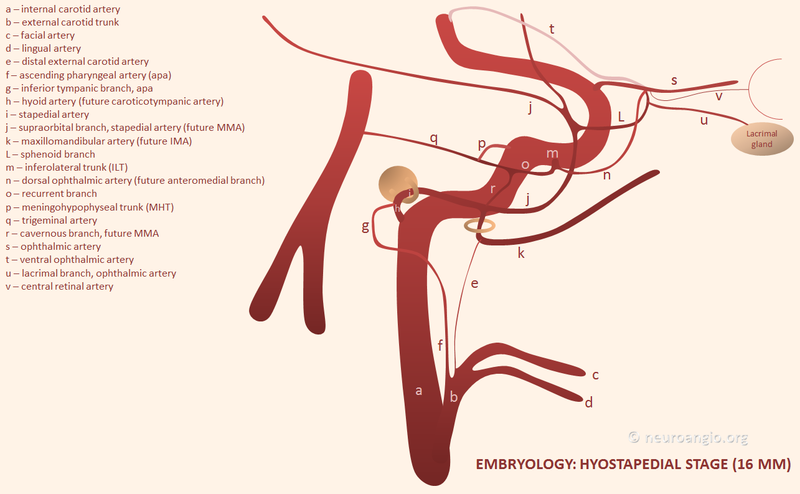 The most famous of “dangerous anastomoses” MMA has embryonic connections in the orbit. Like anything, there is a spectrum. 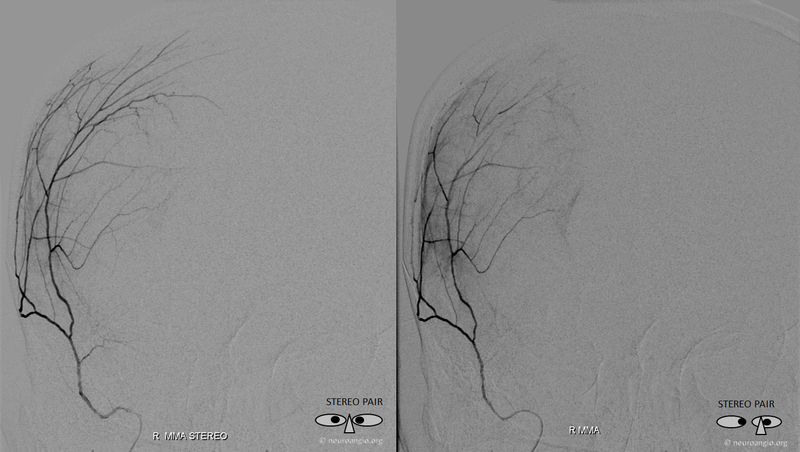 Sometimes, the connections are tiny, sometimes large in a way that makes MMA the primary supply of orbit, and anything in-between. And vise versa — the “recurrent meningeal” is when the ophthalmic artery supplies the MMA — part or all of it. 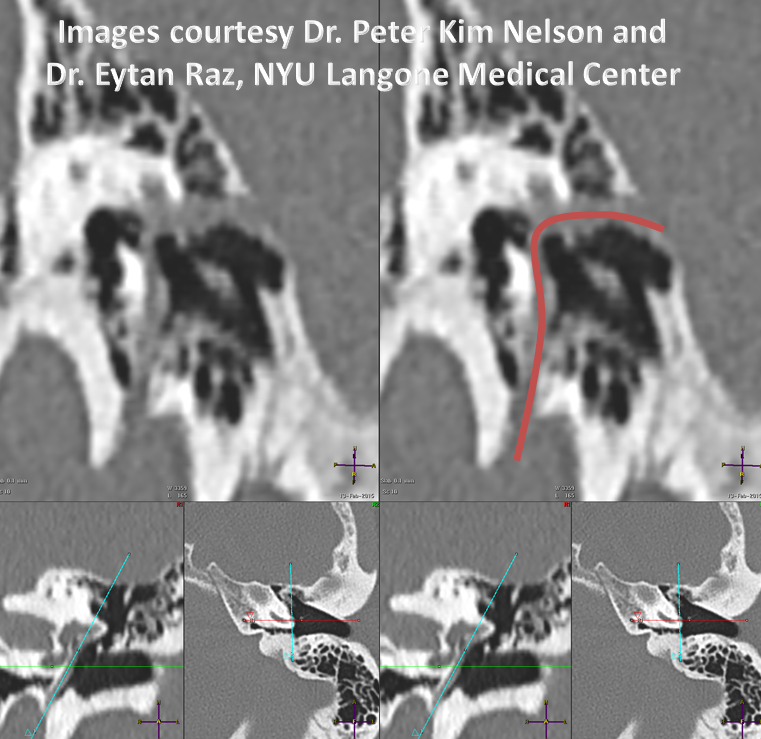 When MMA arises “normally” from IMAX, connections with orbital vessels come from the sphenoid branch of the MMA — running forward and up from the spinosum to get to the sphenoid ridge. 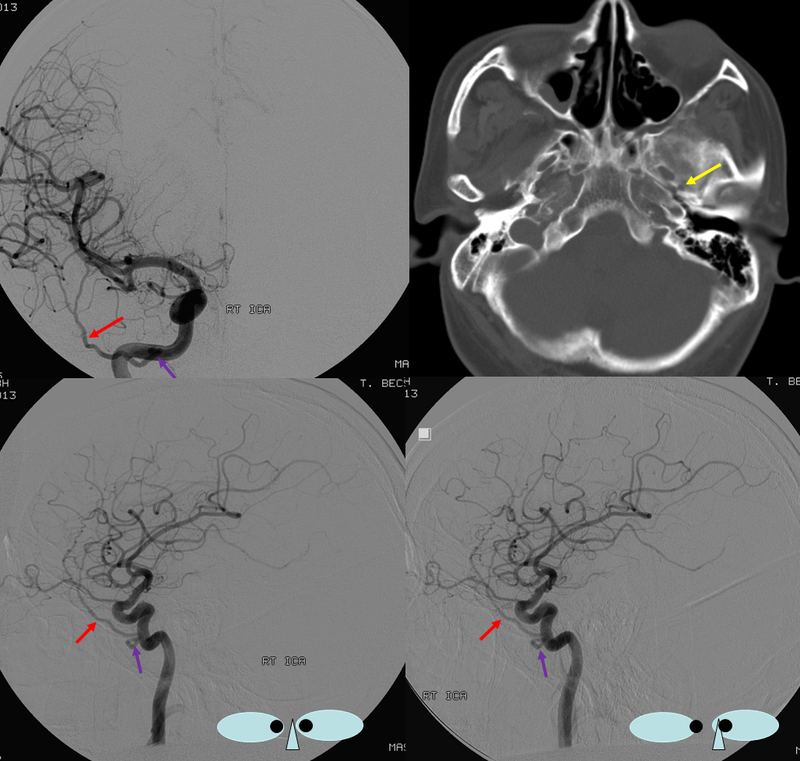 From there, connections enter orbit via the superior orbital fissure (SOF) and/or via its own foramen, known as foramen of Hyrtl. Two broad patterns are present — complete MMA supply of the orbit — meningophtalmic (or meningo-ophthalmic) artery — in which case it enters via the SOF, and partial supply restricted to the lateral orbit and specifically the lacrimal gland — meningolacrimal artery — in which case it enters via the Hyrtl foramen. Simple. IMPORTANT: Like everything else, there is a continuum. One can have a “full” meningo-ophthalmic or meningolacrimal or co-dominance — just like one can have a fetal PCOM, no PCOM, co-dominant PCOM and P1, etc. See below. 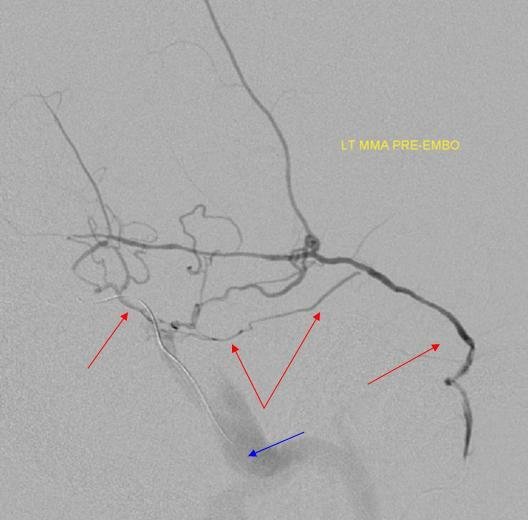 MMA supply to lacrimal gland and lateral orbit. Enters via its own foramen of Hyrtl, lateral to the SOF. 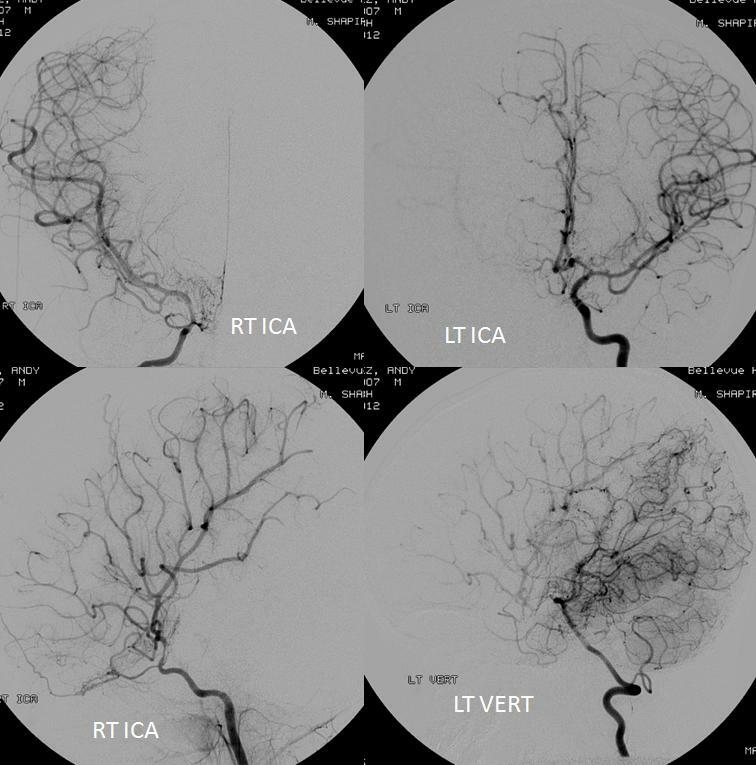 Intra-orbital connections with ophthalmic artery are usually distal to origin of the central retinal artery, however extreme caution must be exercised nevertheless. 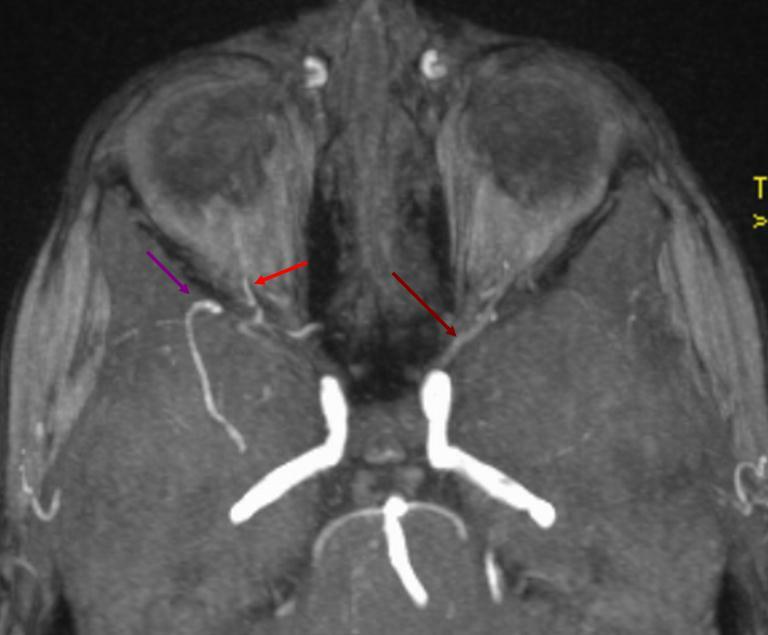 ECA injection shows MMA (purple) and sphenoid branch (white) supplying via the lacrimal branch (brown) the lacrimal gland (peach). 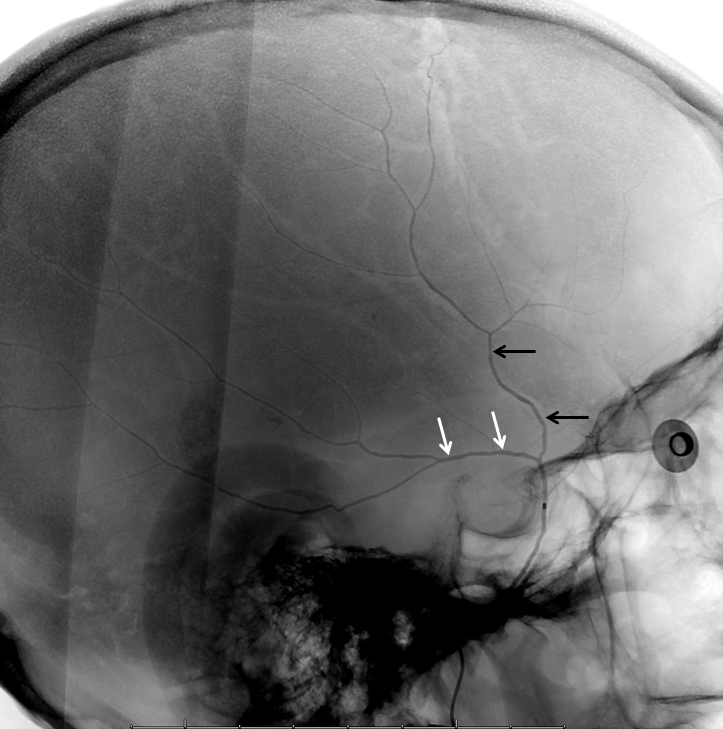 Note lateral entry of lacrimal branch into orbit (foramen of Hyrtl). 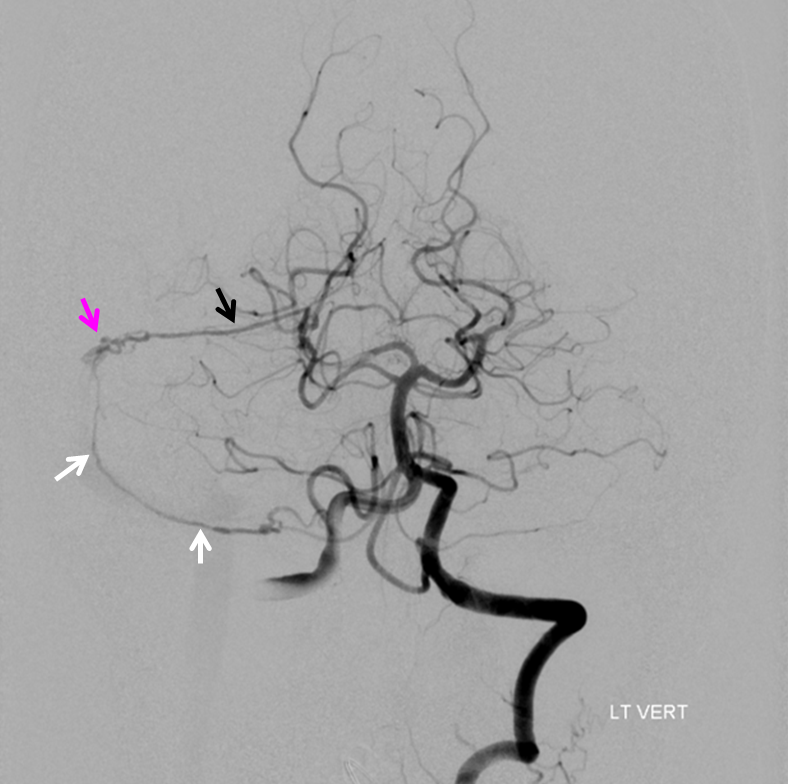 A more medial branch (red) likely connects the lacrimal branch to the ophthalmic artery. 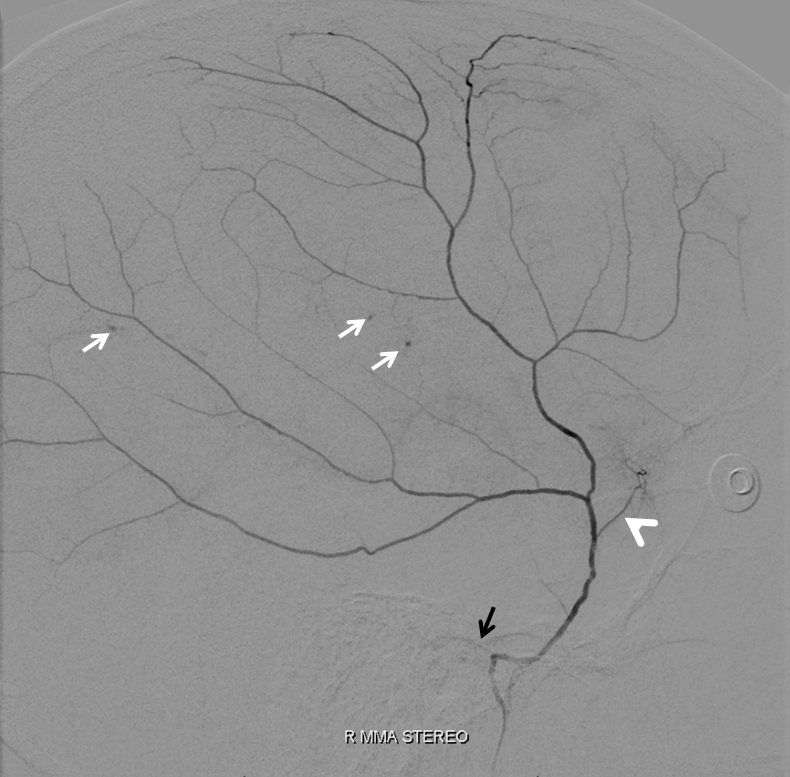 The flipside to above is MMA origin from the ophthalmic — it is by far more common than meningo-ophthalmic artery. 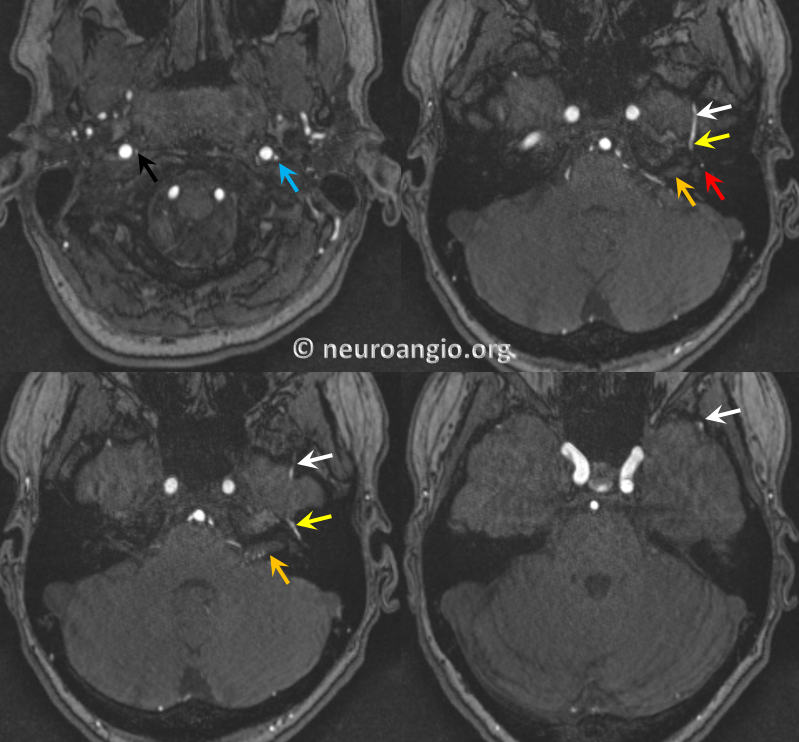 There are several “sub=variants” and, like anything else, there is a spectrum — sometimes the recurrent meningeal branch only supplies the frontal territory of the dura, with “normal” IMAX origin of small MMA restricted to the temporo-parietal region. 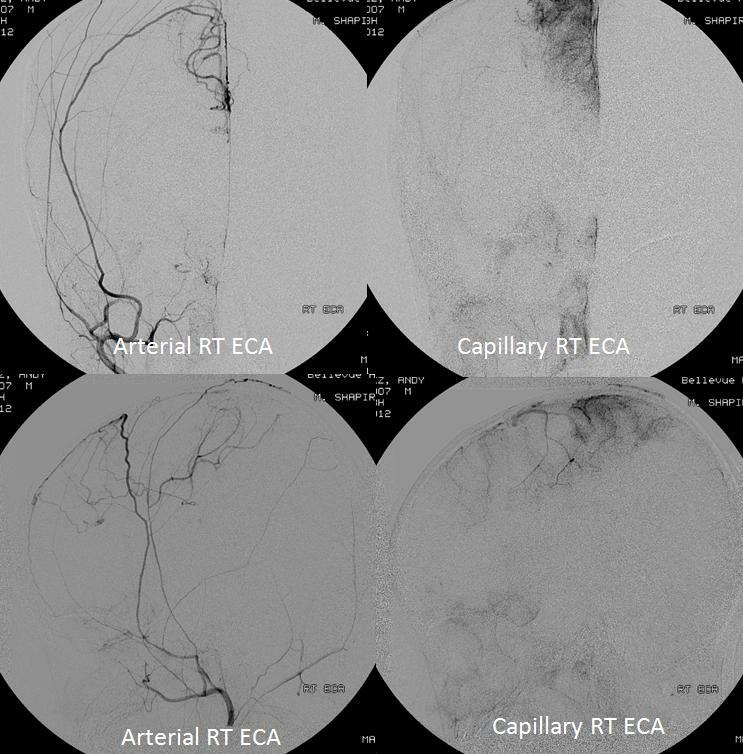 All of these variants imply inability to use the MMA for embolization without catheterizing the ophthalmic artery and risking blindness. 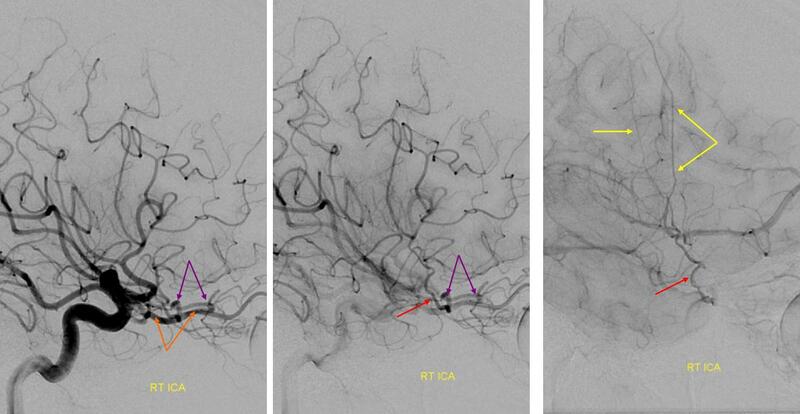 Below the recurrent meningeal artery (B,C) is shown. 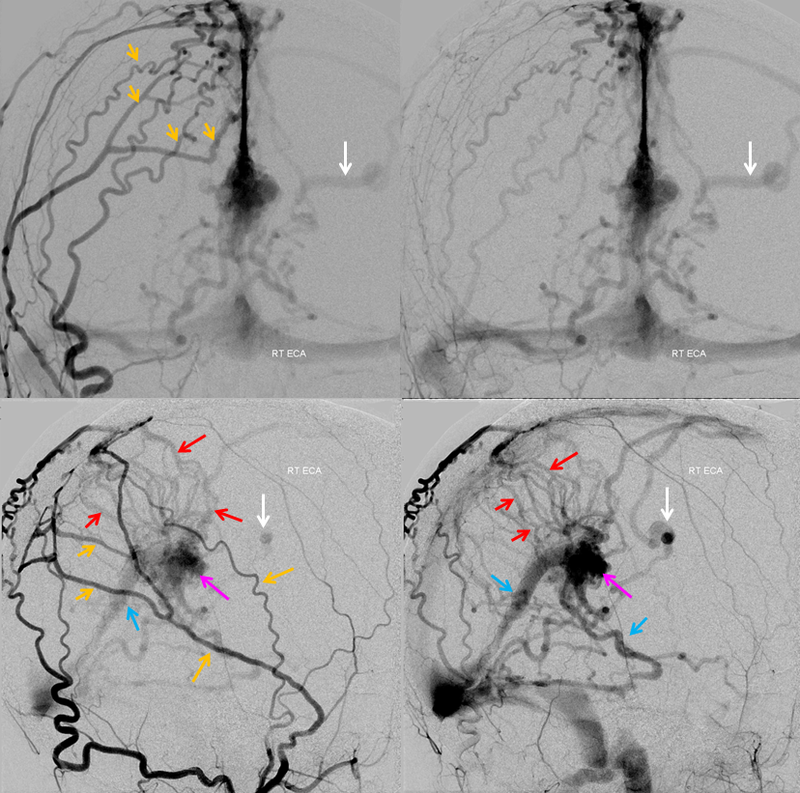 Angiographic example (ophthalmic = orange, recurrent meningeal = red, frontal branch = yellow). 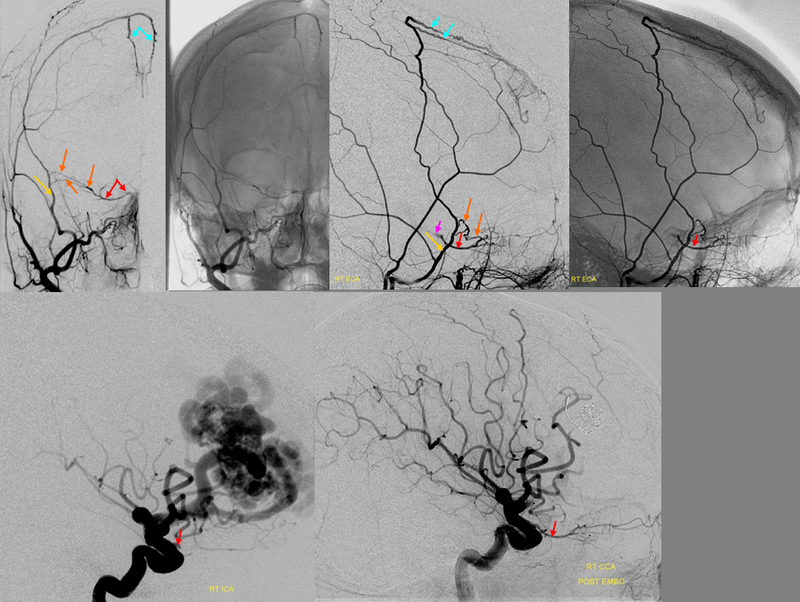 Notice that only frontal branch is supplied — a very common theme. 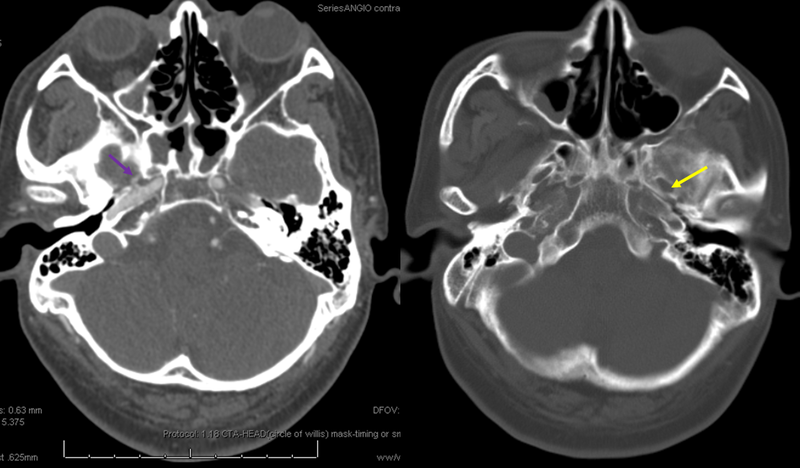 In terms of “dangerous anastomoses”, the most important ones are petrosal and sphenoid branches discussed above. 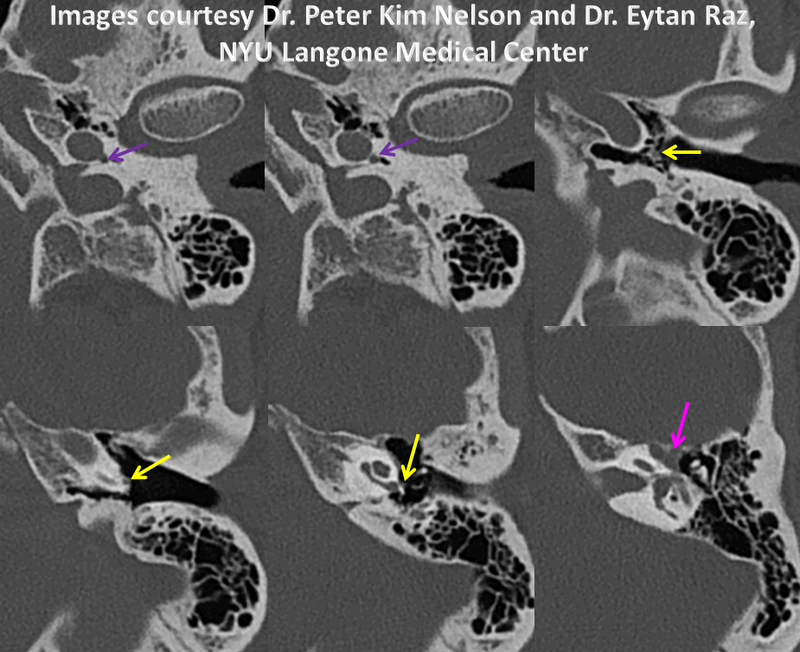 Distal to the sphenoid, there are occasionally important things to consider (antosynagniosis, see below, for example) but generally speaking its very safe territory. 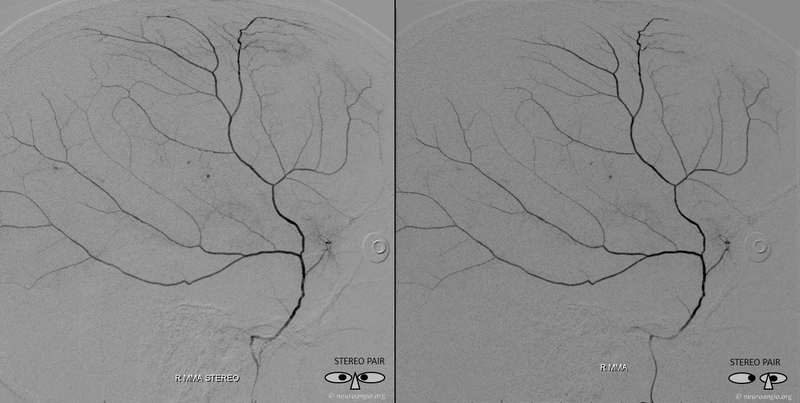 If you want to see distal branches of the MMA, look at the inside of dry skull, where MMA makes groovy impressions. 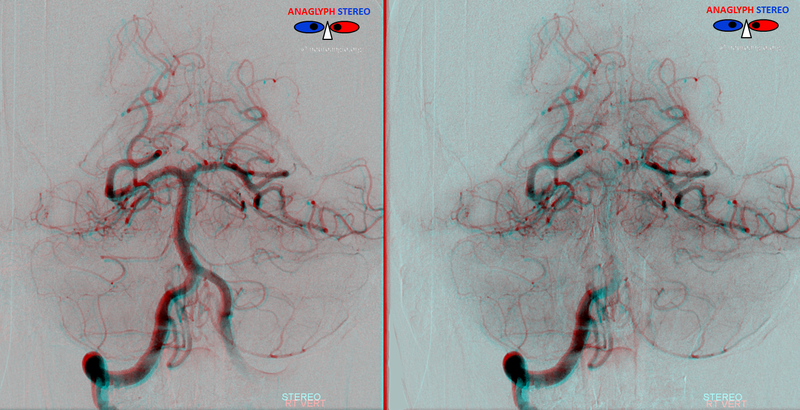 Netter has it best — see one of his awesome images below. 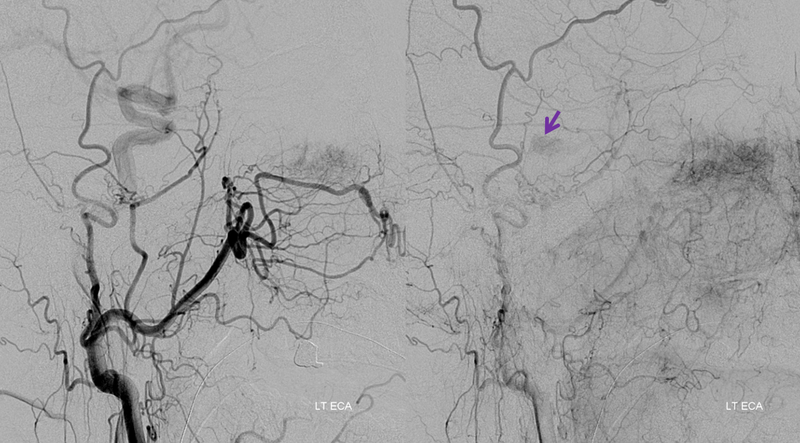 Notice how the artery travels in the center of the larger vein (tram-tracking). We will get to this later. 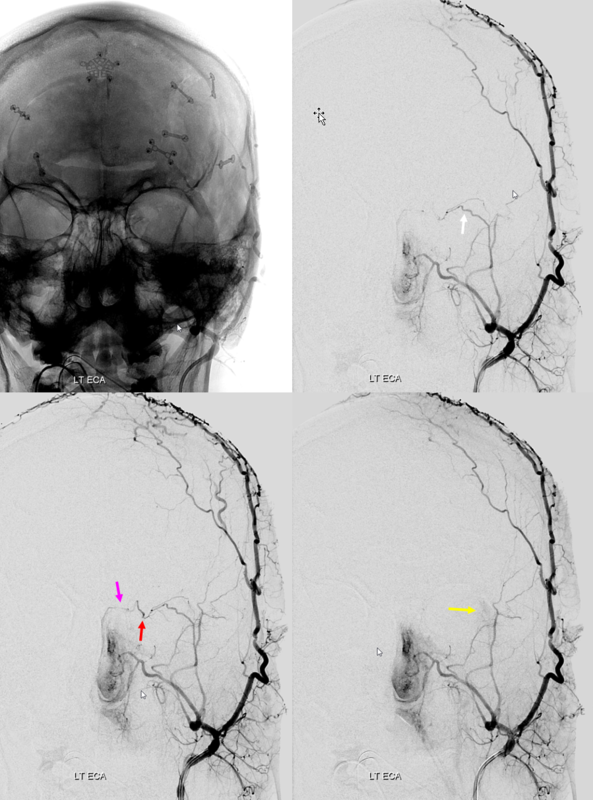 Lateral DSA of MMA in a patient with a subdural hematoma, where the vascular network is particularly obvious, including several areas of obvious leakage (arrows). 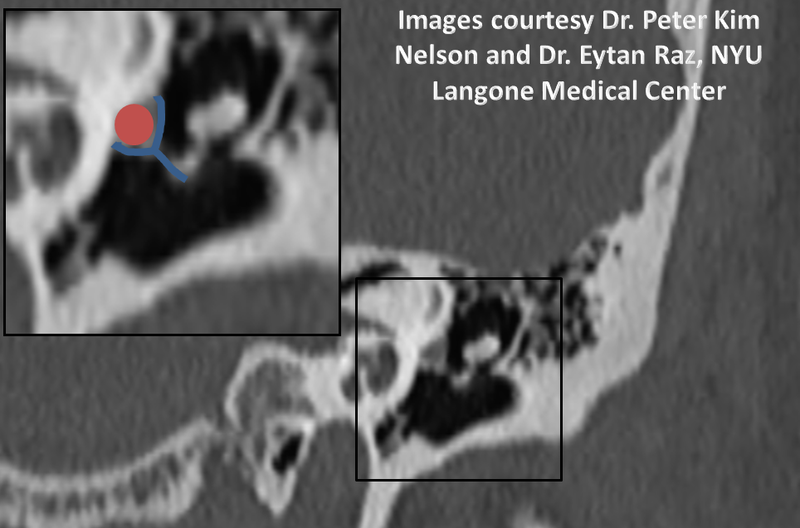 Also notice small petrous branch (black arrow) and sphonoid branch (white arrowhead). 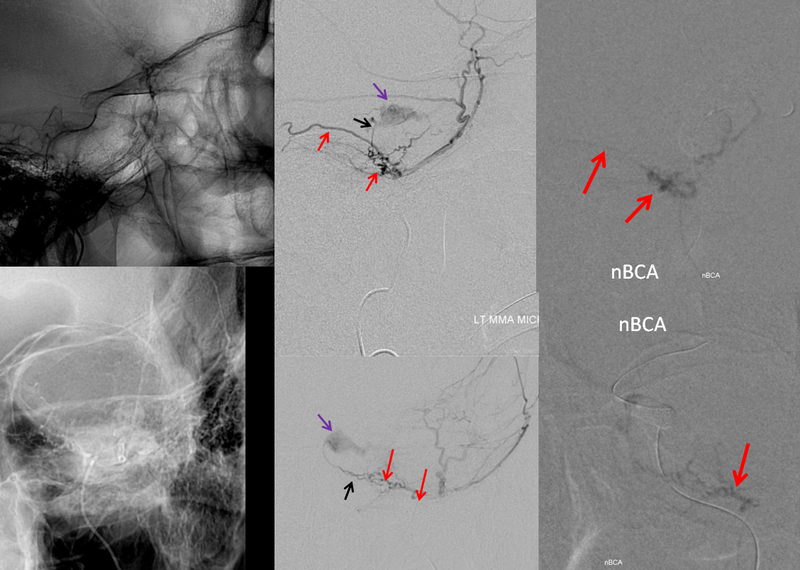 Better get that microcatheter more distally before taking this MMA down. 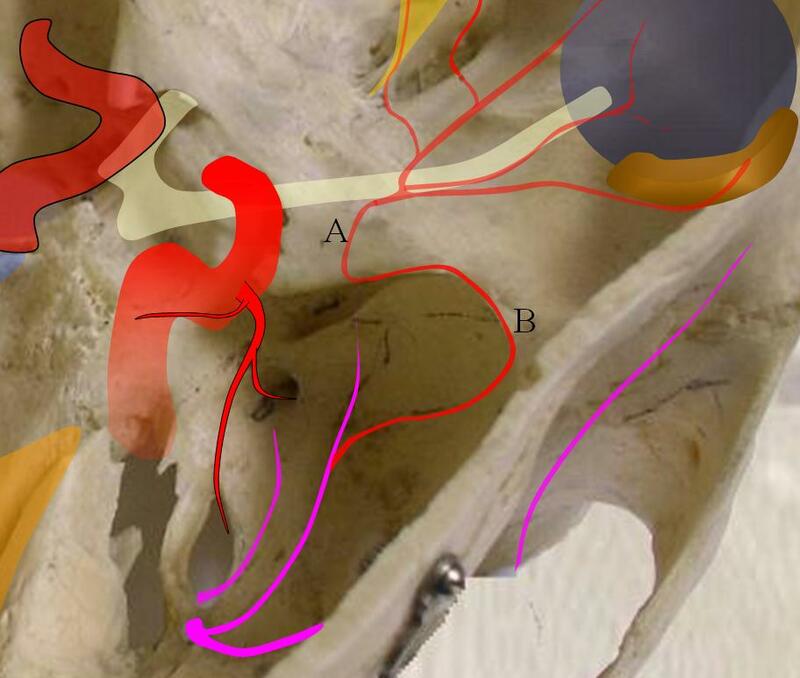 Selective injection of the petrosquamosal branch demonstrates a fistula in the sigmoid sinus region opacifying the sinus (blue arrows). 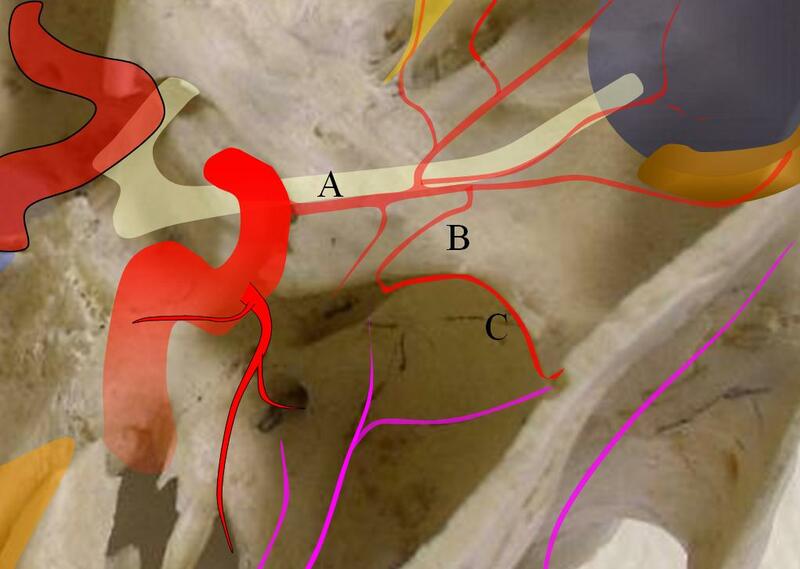 The fistula was embolized with glue from the branch with the leftmost red arrow. 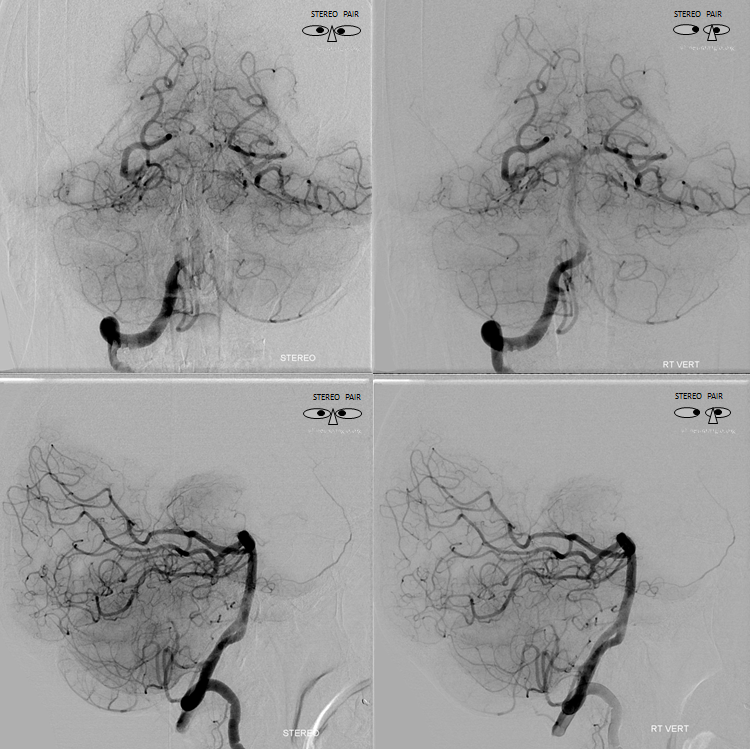 The key thing to understand is that the dura has huge capacity for vascular augmentation, as shown by myriad vessels seen in dural fistulas. 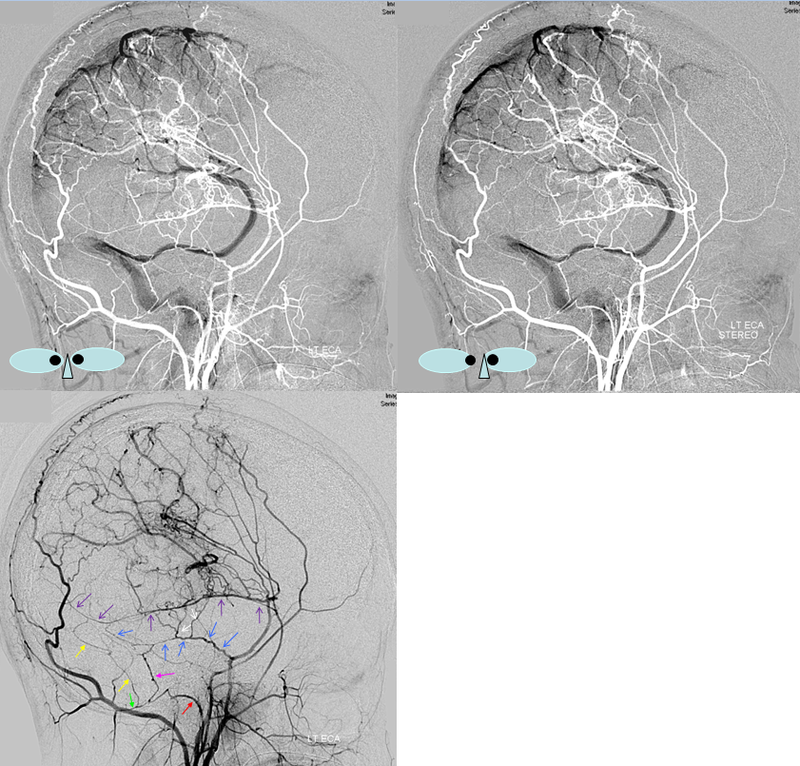 There are important arterial branches in the walls of dural sinuses that are key to understanding dural fistulas, but are heretofore unnamed and get little attention despite having a constant, defined location and important role in regional pathology. 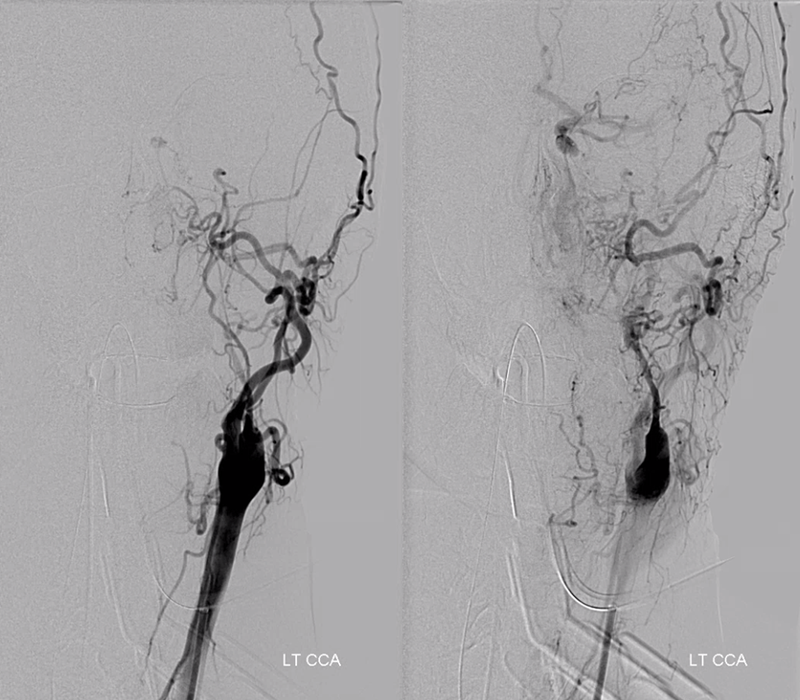 They are however very real and seen in all kinds of settings, including normal, fistulas, hypervascular tumors, etc. 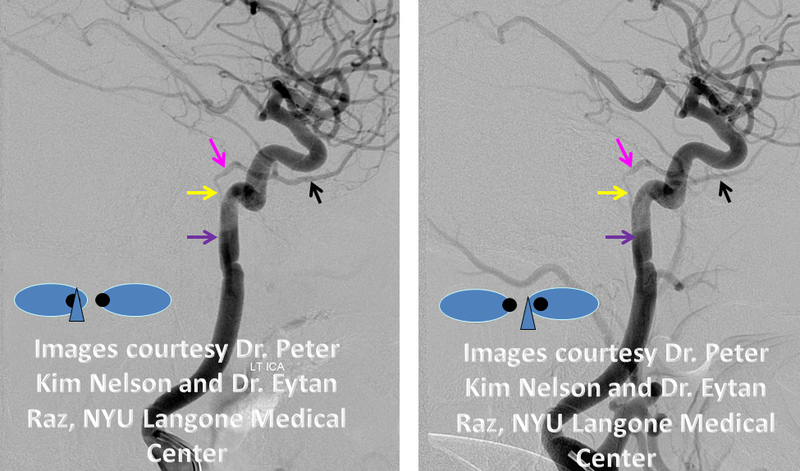 These are illustrated in the figure below and, for clarity, given names such as “superior sagittal sinus artery”, “transverse sinus artery”, “sigmoid sinus artery”, “straight sinus artery.” Lets see if they stick. 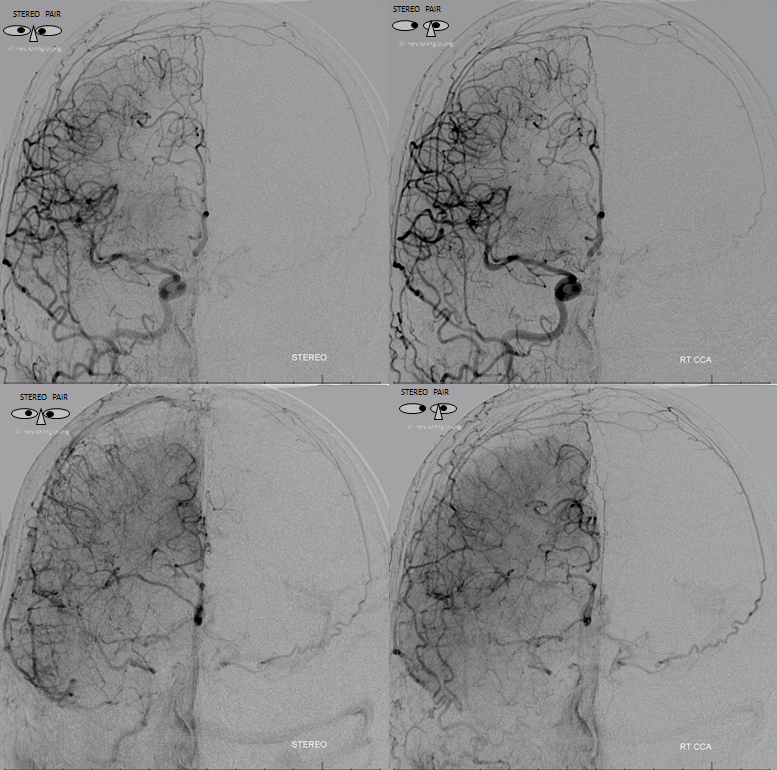 Below are some examples, and links to others, to show how this works. 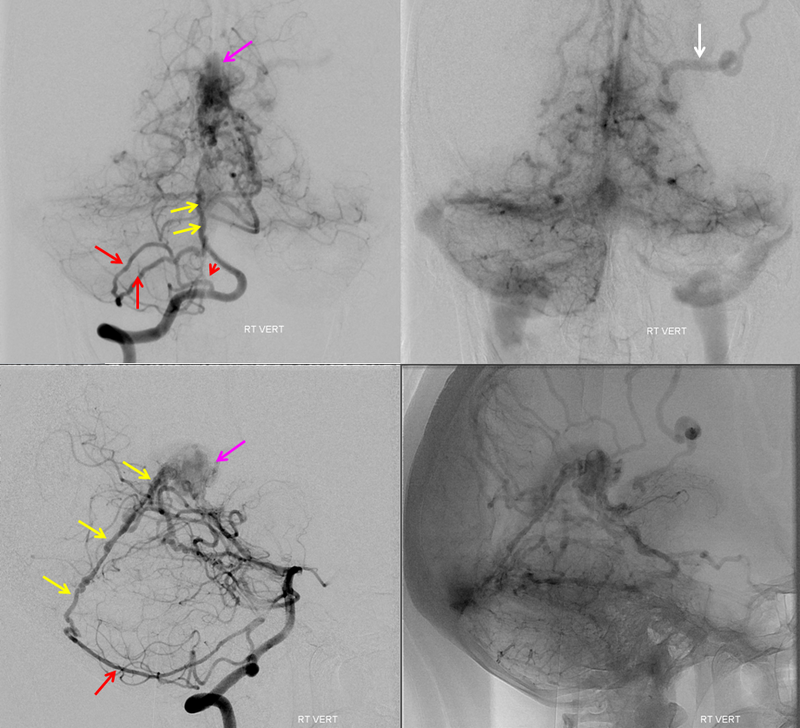 Same case, with posterior meningeal artery (red) opacifying the artery in wall of the straight sinus — “straight sinus artery” (yellow). 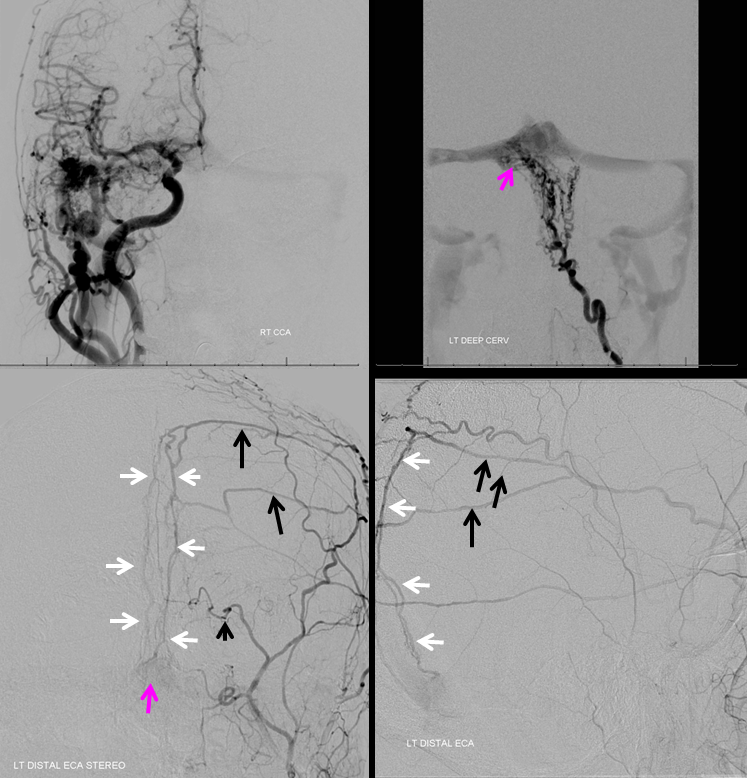 Fistula point is pink again. 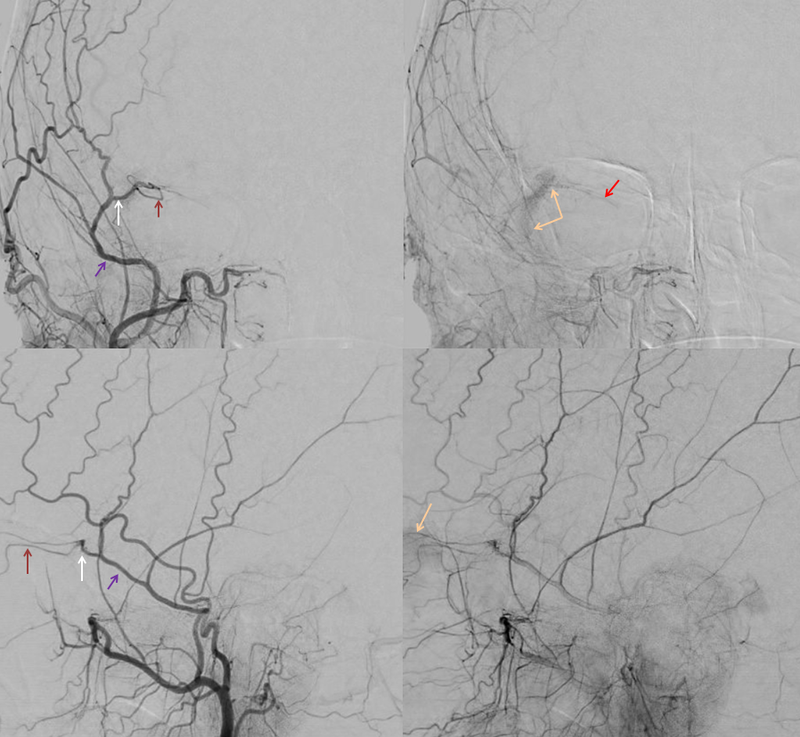 Sump from AVM reverses flow in the ophthalmic artery (red) with primary retrograde supply via the sphenoidal artery (orange) branch of the MMA (yellow). 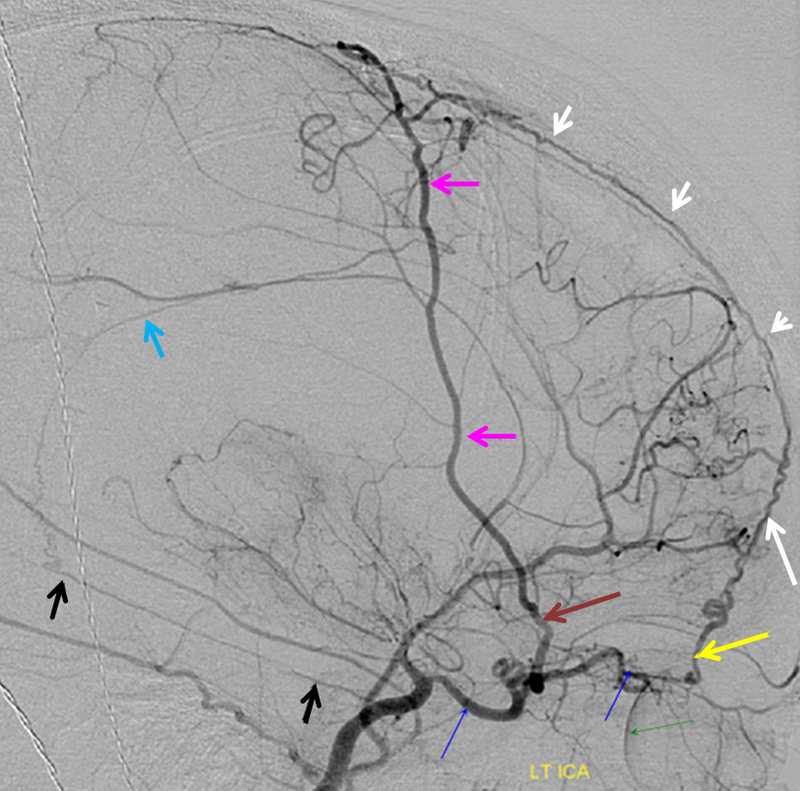 As a consequence of AVM reorganization, an autosynangiosis of the mid-sagittal anterior frontal convexity developed, supplied by two Superior Sagittal Sinus Arteries (blue arrows). 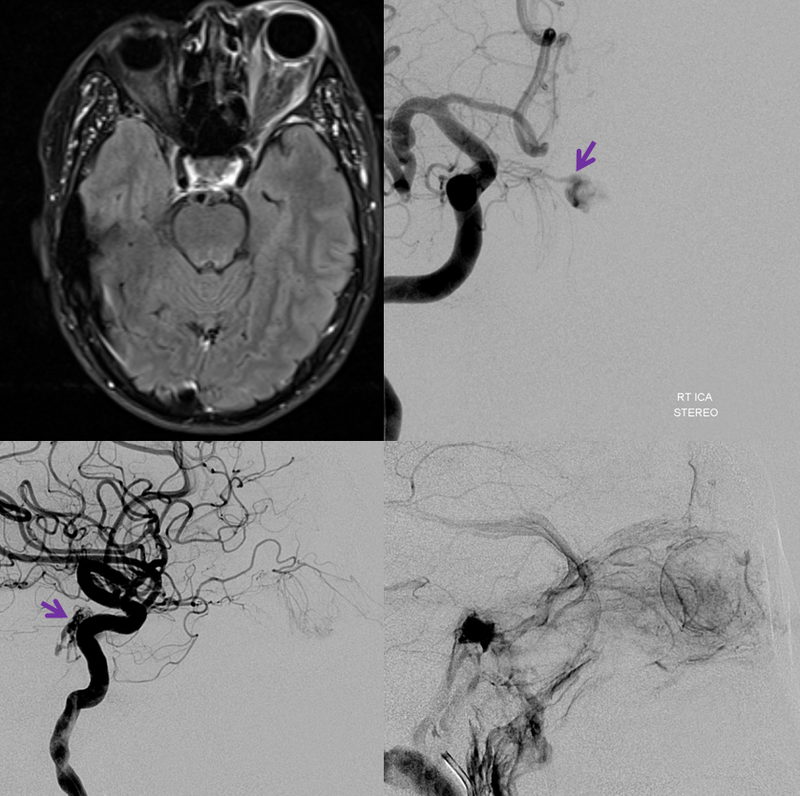 Patient with bilateral Moya-Moya, post bilateral dural synangiosis and burr hole (see Intracranial Collateral Pathways for the remainder of this case). 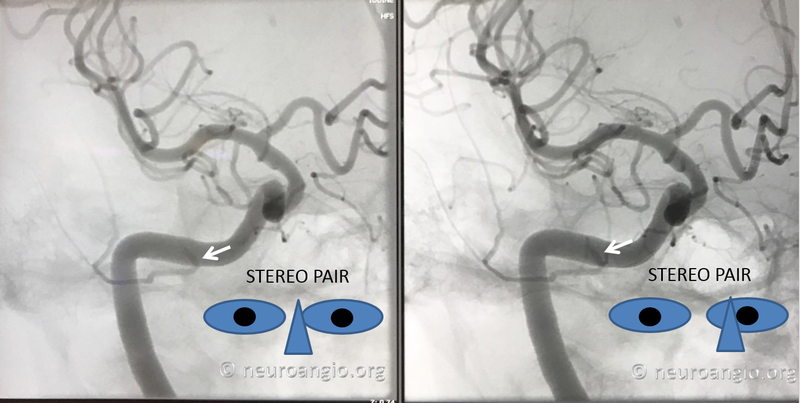 Stereo image pair on top, with dural/ arterial vasculature in white, and venous outflow in black, outlining an arterial arcade which runs within the dural sheath of the transverse/sigmoid sinuses, partly made up by the jugular branch of the neuromeningeal trunk of the ascending pharyngeal artery. 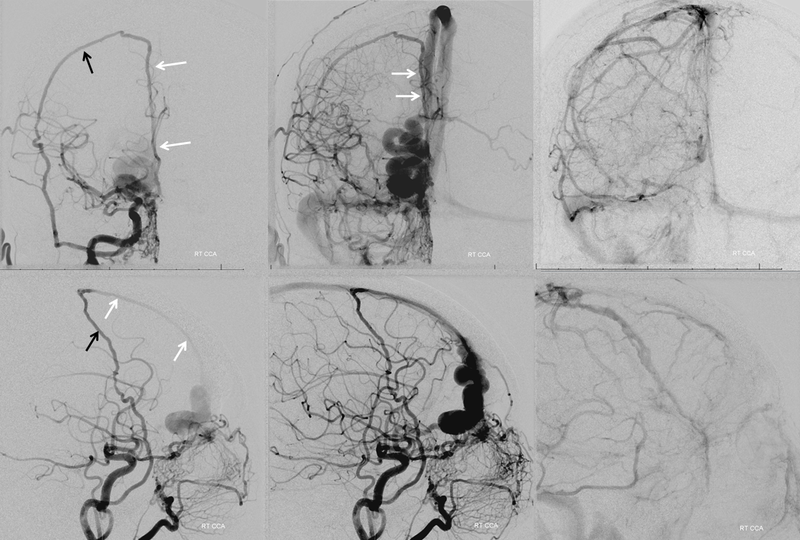 Anastomoses with middle meningeal and occiptal branches are clearly demonstrated. 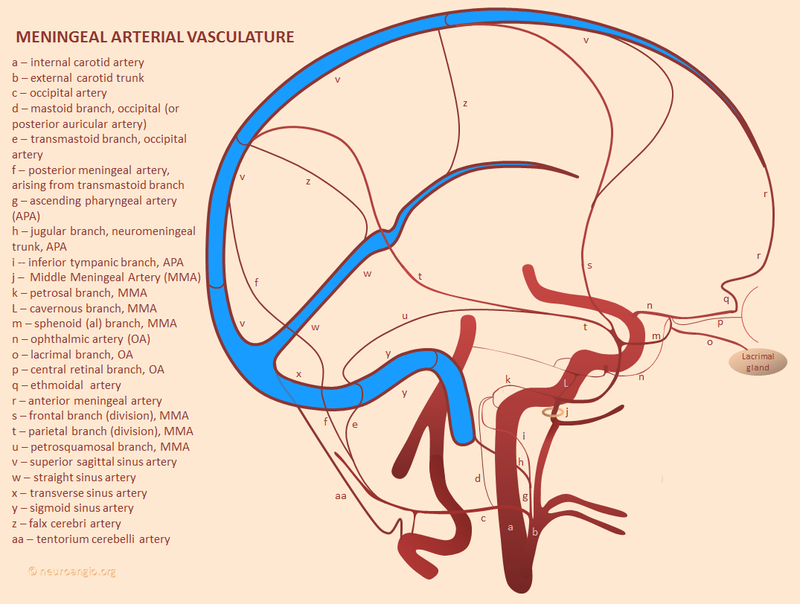 These arteries frequently participate in supply of sigmoid sinus dural fistulas. 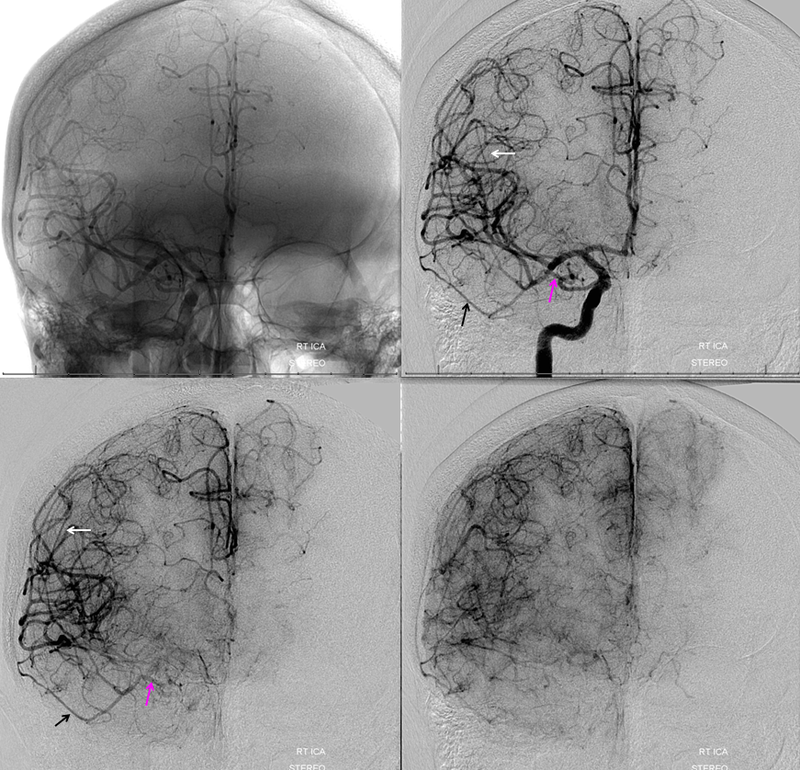 Chronic cortical ischemia promotes natural recruitment of meningeal vessels to help supply the brain, known as autosynangiosis, in contrast to the surgical synangiosis which aims to accomplish the same purpose by overlaying dura, muscle, drilling holes, etc in the head. 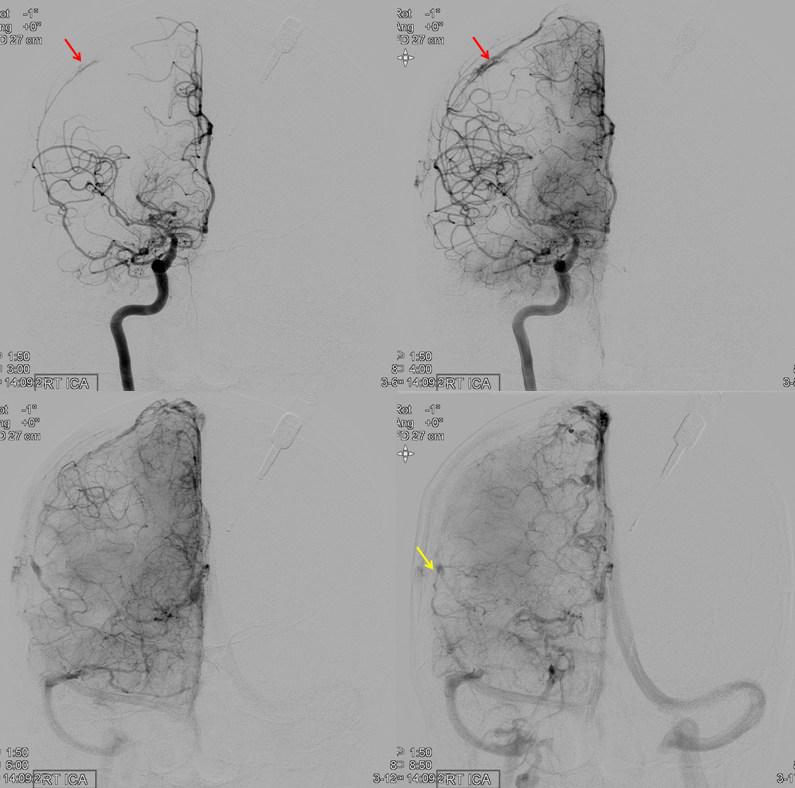 This process is more robust in younger patients, often encountered in angiographic evaluation of Moya Moya disease. 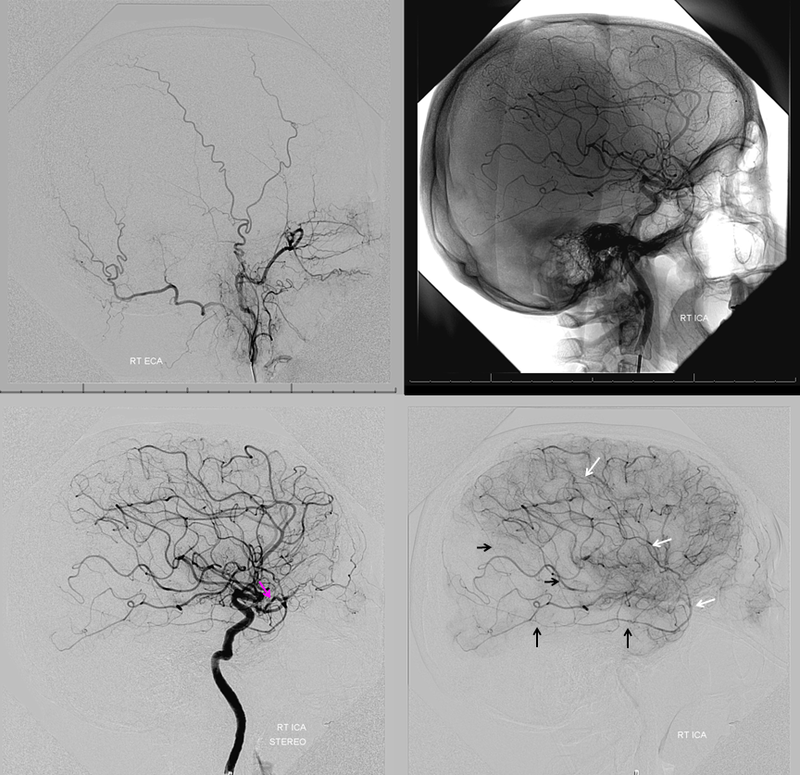 Here is an example in a 4 year old with Moya Moya with severe ACA territory disease, and secondary MMA autosynangiosis helping out this territory. 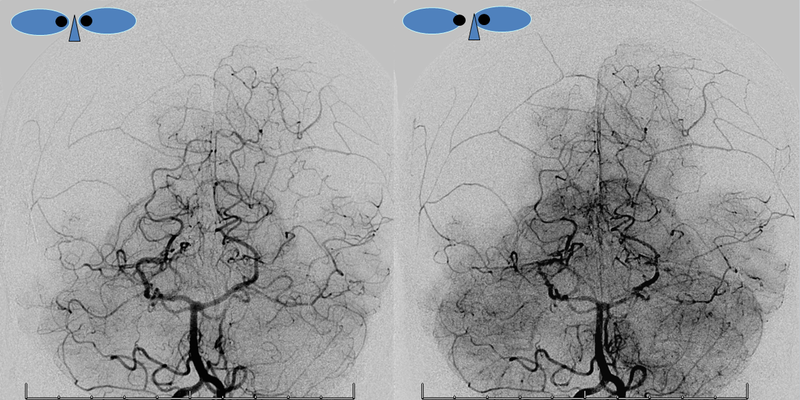 Notice also a faint autosynangiosis between ethmoid arteries from the ophthalmic and frontal lobe base.